KJIPUKTUK (Halifax) – On Tuesday, August 22, the provincial government enforced the Public Services Sustainability Act (Bill 148), imposing a four-year wage package on 75,000 public employees. Even at current low rates of inflation, this could result in a real wage cut of about 7%. In addition, the Act peremptorily removes a long service award scheme that the unions accepted many years ago in lieu of up-front wage increases. That approximately a further 2% pay cut for new employees. Together, the two measures shrink the standard of living our public service workers, which is among the lowest in the country. The Act also prohibits arbitrators from exercising any discretion on these issues when called upon to settle a dispute. It even prohibits arbitrators from ruling on the constitutionality of the Act, as they legally have the right to do. Critics argue that this legislation and other recent laws, like the Teachers’ Professional Agreement and Classroom Improvements Act (Bill 75), violate the Charter of Rights and Freedoms. The Supreme Court of Canada has ruled that the Charter guarantees the right to bargain collectively and to strike. The highest court says that governments can deny the right to strike only when a reasonable substitute is available – i.e. binding, unfettered third-party arbitration. But the Nova Scotia government has refused to do that. It wants no strikes and no substitutes. The government has put part of the Act before the Nova Scotia Court of Appeal for its opinion on constitutionality. Immediately, Premier McNeil went on radio, television and other media to state the government’s case. Again and again, as if stuck on auto-repeat, he has insisted that he would not allow “an unelected, unaccountable arbitrator” to determine what is fair compensation. Let us interrogate that assertion. It is true that arbitrators are not, like politicians, elected by universal suffrage. They are selected jointly by labour and management, from a list of highly-qualified academics, lawyers or former judges, all of whom are well-versed in the intricacies of labour relations, law and economics. Talking about the judiciary, Canadian judges are also unelected. Indeed, the very same judges of the Court of Appeal to whom the government is respectfully submitting its legislation, are unelected. If McNeil really distrusts unelected umpires, then he is being hypocritical, at the very least. In fact, the unelected state of judges and arbitrators is a virtue. It allows them to be fiercely independent and not subject to political or other pressures. And that speaks to McNeil’s second accusation – that they are unaccountable. If by unaccountable he means that he doesn’t want them to be independent and not subject to political pressure, then he should come right out and say so. Both judges and arbitrators are accountable – to the law, to higher levels of appeal and, ultimately, they are accountable to the forum of public opinion. There was a time in Canada when workers were not allowed to join and participate in unions, to bargain collectively and to strike. How did they finally win some quantum of democracy in their workplaces? They joined unions and bargained collectively and went on strike anyway, despite the law. Some employers reluctantly negotiated. Others called in the police, the army and private security firms and violence ensued. When the situation threatened chaos, the state finally stepped in and tried to impose some order. It regulated unions, collective bargaining and strikes. And it worked – much better than before. Unions and collective bargaining and, yes, strikes, are part of the price we all pay for living in a democracy, convenient or not. Bill 148 takes us back to the dark ages and workers, again, will have to take matters into their own hands. 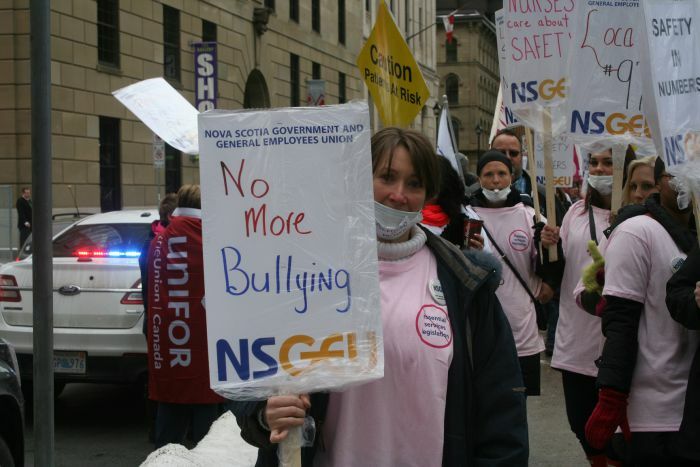 Larry Haiven is professor emeritus of labour relations at Saint Mary’s University, a research associate of the Canadian Centre for Policy Alternatives – Nova Scotia, and a member of Solidarity Halifax. Enough is Enough take it to courts! We will win based on others that went to court before us for this same thing in other Province’s And Guess what they Won!!!!!!!!! Very simple, rant and rave and go one, but the so.ution is the Supreme Court of Canada where it will be overturned and ruled as unconstitutional. This is one of the best written, succinct pieces outlining the breathtaking regressiveness of this bill, that I have had the pleasure of reading. It points to the non sequitur logic of this Premier and his elected affiliates .